Pizza. While dessert is often incredibly hard to pass up for most people (deep down, we all know we should), there are still delicious savory foods that succeed in having the same effect on us. For me, one of these foods is pizza. Particularly homemade pizza. Even more particularly, my Mom's homemade pizza. Pair that with a from-scratch pizza dough made with love, and you've earned my heart. During the summer I went to Italy with my family -- an experience I had anticipated for years. Italy was too beautiful to be described in words and every meal was incredible. By the end of the trip, I thought I had eaten enough pizza (plus gelato every day) to last me a lifetime. As it turns out, I didn't, because here I am again in the same position… eating pizza. This is not the first time I've eaten this pizza. It became a family favorite the moment we took our first bites, and the spinach and goat cheese combination was one we had never tried before. Originally, my wonderful mother created the topping impromptu and without a recipe, but it turned out so delicious that it needed a place as one of our staple meals. Now, I have recreated it perfectly and recorded the recipe. I'm a thick crust gal. The great thing about making your own food is the option of making it exactly the way you like it. I used my favorite pizza dough recipe, which yields a nice, thick crust. 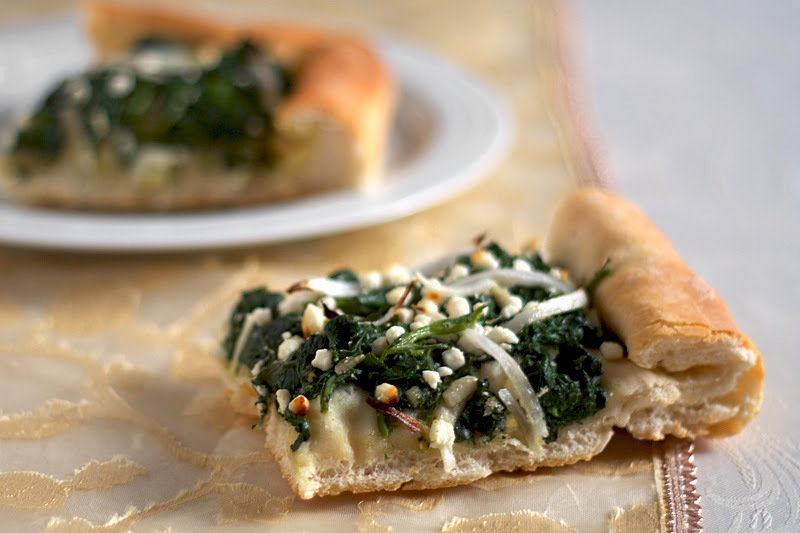 The spinach is sautéed with a bit of olive oil and garlic before topping the pizza, and the goat cheese adds a great tang to the flavor. Is it possible to get tired of pizza? I don't think it's possible. This is pizza we're talking about. Dissolve the yeast and brown sugar in a large bowl; let sit for 10 minutes. Stir in the salt and oil. Add 3 cups of flour. On a clean, well-floured surface, turn out the dough and knead in more flour until dough is no longer sticky. If the dough is too wet, add more flour. If the dough is too dry, add a small amount of water. Place the dough in a well-oiled boil, cover, and let rise in a warm place for 1 hour. Meanwhile, prepare the topping. Preheat oven to 425 degrees F. Fill a heavy saucepan with water until about three-quarters full; bring to a boil and add the salt. Add the fresh spinach and boil until the spinach turns a bright green. Remove from heat and drain spinach. In a frying pan over medium heat, sautée the garlic in the oil for about 1 minute but not until browned. Increase the heat to high and add the spinach, cooking until all the spinach has wilted. Remove from heat. Punch down the pizza dough to form a tight ball. Allow the dough to relax for 1 minute. Roll out the dough to fit a large pizza pan, and place the dough in the pan. Top the dough with the spinach and spread it evenly. Add chopped onion and crumbled goat cheese. Bake the pizza in the preheated oven until the crust is golden, about 15 to 20 minutes. Great pizza! 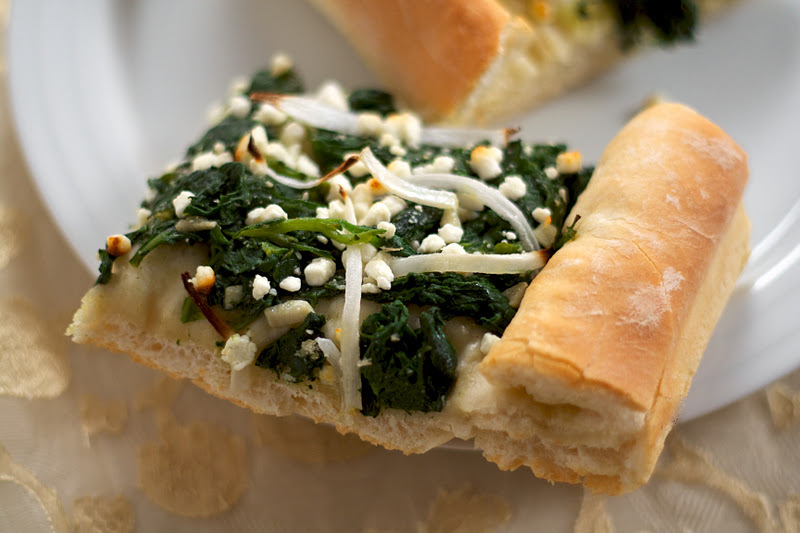 The spinach and goat cheese look awesome! And yeah, it's impossible to get tired of pizza, you just can't! Delicious! 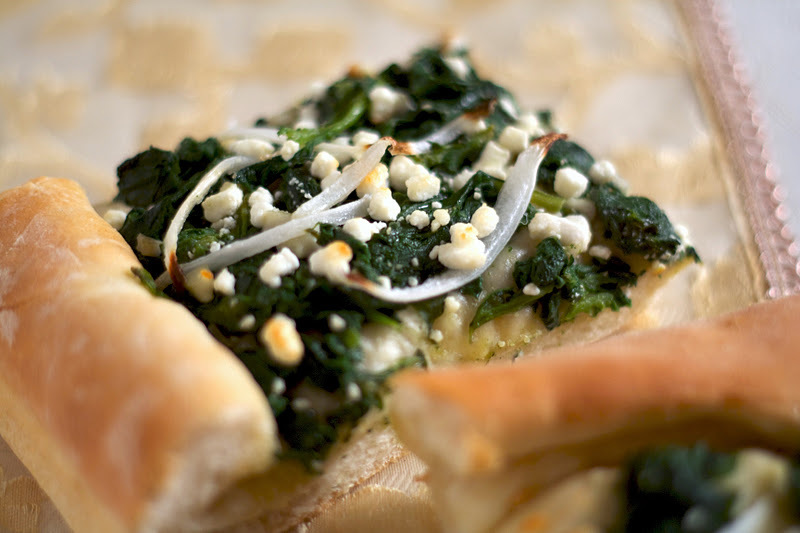 Spinach and goat cheese is a perfect combination! I love how much topping you've packed on there. My husband would adore you for this pizza! Wow looking pizza...love the spinach and goat cheese in there. Oh wow, this looks good. I am so obsessed with pizza, and this is making me drool. I love that you saute the spinach in olive oil and garlic instead of just plopping it on the pizza plain. looks delicious! This is one exceptional pizza. I am in awe. I love this post! I love Italy and I love pizza! Pizza is the perfect canvas for experimenting with new flavors and goat cheese with spinach is definitely one of my faves. Also, like to add roasted red peppers and kalamata olives to this pizza, which I guess maybe makes it more greek. But super delicious! Thanks for sharing, your photos are beautiful and I am curious to try this thick crust recipe, because I too am a thick crust kinda gal! It's true, a pizza leaves plenty of room for experiment. I adore roasted red peppers as a pizza topping but I've never thought to add kalamata olives -- great idea! I'll remember to try that for myself sometime! Ooh. Look at this pizza! 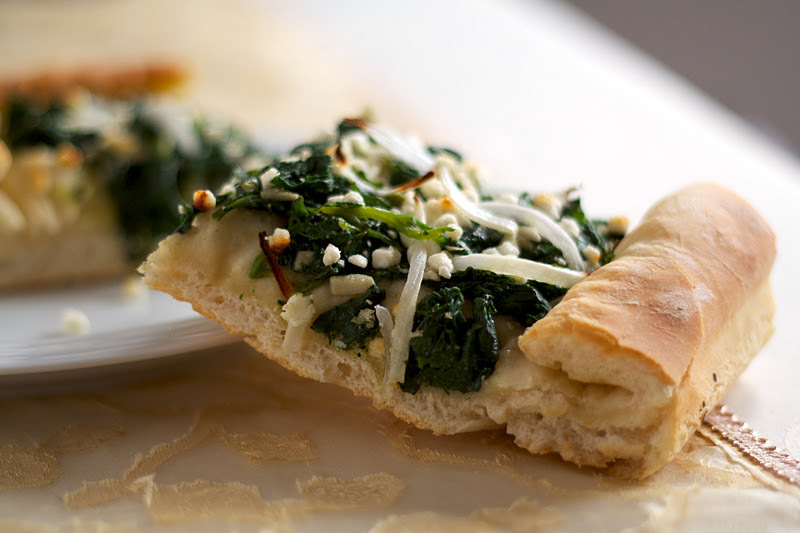 Spinach and goat cheese sounds perfect! Made this last night with some whole wheat pizza dough I made nights before. Simple and delicious recipe. Since my smaller pizza looked a bit bare with just the cheese, onions, and spinach (didn't remove the stems as I didn't think it necessary) I added the left over spinach sauce from Giada's penne recipe (since the sauce also has goat cheese, spinach and garlic in it http://www.foodnetwork.com/recipes/giada-de-laurentiis/penne-with-spinach-sauce-recipe/index.html). The pizza was a pretty collage of bright green from the sauce, dark green from the spinach, white from the cheese and translucent from the onions and when it came out of the oven the spinach was soft and silky. A good pairing with the crumbly cheese. Thanks for the recipe! I'm glad you enjoyed it, and it sounds like the sauce you used was a great addition. Thanks for letting me know! friends exactly who really like gizmos. I’m certain they're able to enable. The Firefox updated tab pops up everytime i start firefox. What do i do to stop it? Hi there to every one, for the reason that I am actually eager of reading this website's post to be updated regularly. It contains fastidious stuff. the truth nevertheless I'll definitely come back again. Rubber Mulch Playgrounds All About Mulch! perform it on his family's television show. "For Lack of a Better Name". Music situation serves as a "vocation sponsor" for outside the box musical performers. Great items from you, man. I've take note your stuff previous to and you're just too magnificent. like what you are stating and the best way through which you are saying it. are virtually 1000's of guys and females who are seeking to create muscle mass and strip off body body fat in purchase to transform the way their bodies' glimpse and really feel. and is regarded as one of the most respected coaches in the world when it comes to building muscle mass naturally. could do with some % to force the message house a little bit, but instead of that, that is excellent blog. Hi to all, because I am really keen of reading this website's post to be updated daily. It includes nice information.